18/7/10 – Discovery – Nice, Musee des Beaux Arts – A major event was announced in the latest issue of the Revue de l’Art in an article signed by Philippe Costamagna and Carlo Falciani  : the discovery of an important Italian Renaissance masterpiece, unknown until now, in a French provincial museum. 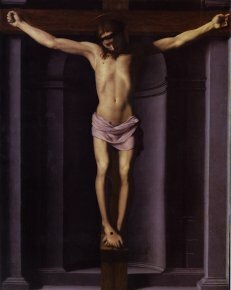 This Christ on the Cross by Bronzino (ill.), which had hung for many years in the Musee des Beaux-Arts de Nice, having entered in 1879 as part of the Defly bequest, had been catalogued in 1902 as a work by Fra Angelico, at least placing it correctly both chronologically and geographically. However, this attribution was quickly abandoned and the painting, then thought to be from the 18th century, fell back into anonymity. During a visit in 2005  the authors of the article were struck by the “obvious” fact, thanks to a fortuitous ray of sunlight on the panel, of the new attribution which had until then escaped other art historians : this was indeed a major work by Agnolo Bronzino, one of the greatest 16th century Florentine painters, and a rare possession for French museums except for the Louvre and Besancon which holds the magnificent Deposition from the Cross. We refer our readers to the Revue de l’Art for a complete accounting of the painting’s history  and a stylistic analysis of the work which is in fact remarkably well preserved. A discovery of this magnitude is practically the equivalent of a new acquisition. In this case, one which calls for a trip to the Musee des Beaux-Arts in Nice . Philippe Costamagna and Carlo Falciani, “Christ en Croix d’Agnolo Bronzino peint pour Bartolomeo Panciatichi”, Revue de l’Art, no. 168/2010-2, p. 45. We point out however that in today’s internet world, it is unfortunate that it took five years to learn of such a painting. The work is quoted by Vasari as having been painted for Bartolomeo Panciatichi, a Florentine citizen who also commissioned four others from this artist, three of which are at the Uffizi today : his own portrait, that of his wife Lucrezia and a Holy Family. The Christ on the Cross by Bronzino will be exhibited during a major retrospective on the artist at the Palazzo Pitti in Florence from 24 September to 23 January 2010.